Stand alone or series: Can be read as a stand alone novel, but possibly the start of a new series? In the mist-shrouded wood surrounding the kingdom of Samorna, The Shifter bides her quiet, lone existence. One day her ten years of solitude are shattered when the Prince and heir to the throne Rokan seeks her out, needing the legendary Shifter’s protection. For centuries, The Shifter has protected the Kings of Samorna; it is her only purpose, and one that she fulfills without question…until now. When The Shifter, under the name Isabel, returns to the kingdom by Rokan’s side, she grasps at faded memories. Inside the palace walls, she cannot remember why she left or what happened to the last King she protected, and she finds herself trapped in her assumed human skin. Unable to shift form, save when Prince Rokan is under direct attack, Isabel has many questions and no answers. With intrigue, secrets, and lies at every turn, Isabel must discover the truth of her past – of her own nature, as the ageless, eternal Shifter – if she is to protect her King. 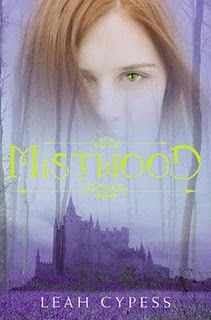 Mistwood is Leah Cypess’s debut novel – a luscious fantasy novel of intrigue, magic, and self-discovery. Isabel’s world is a familiar one with its western-medieval fantasy setting, complete with a naive king, conniving magicians, and a court rife with scheming nobles, but what Ms. Cypess lacks in world-building originality she more than makes up for with her characters – in particular, the female characters. Isabel is The Shifter, who has aided the Kings of Samorna without question throughout the ages, but immediately upon starting this book, readers can sense that something is amiss. Though Isabel is ages old and the personification of the Mistwood magic itself, she has surprisingly human emotions; doubt, anger, confusion, embarrassment – even fear and grief. She cannot remember what has happened to her or the last King of the realm, and she struggles with her own supposedly immutable magical abilities. All Isabel knows is that she feels an urge, a deep-seated need to protect the Prince that has claimed her as his own. I loved this heroine. Isabel’s struggles with human emotions and with her ancient, unchanging nature as The Shifter is a careful, insightful character study throughout Mistwood. I loved that for a creature so (supposedly) supremely powerful there IS an explanation for why she acts the way she does, especially since it was so unexpected a character revelation. I loved that Ms. Cypess examines the issue of duty, of fate and of choice so thoroughly, and Isabel’s journey of self-discovery (because, really, that’s what this book is all about) is all the more poignant for it. Powerful but not infallible, magical but not indestructible, Isabel possesses that elusive blend of strength and vulnerability so irresistible in a heroine. But beyond Isabel, I absolutely ADORED (and despised) the character of Clarisse – Rokan’s sister. The ladies take center stage in this book, and it is a relief to read fantasy characters that don’t fall into the mother/virgin versus evil/temptress dichotomy. Clarisse is an enigma – she’s cunning, but her loyalties are impossible to discern (even after finishing the book, I have no idea where Clarisse stands). Beautiful, ambitious, deeply wounded but oh-so-deadly Clarisse is a character that keeps Isabel on her toes, and readers too. I cannot stress this enough – I love that debut novelist Leah Cypess does not simply create “good” and “evil” characters. Hers are shades of grey, good and bad alike, and no one is more indicative of this than Clarisse. Mistwood has been compared to the works of Tamora Pierce, Kristin Cashore, and Megan Whalen Turner, but I’d dare to add one more author to that list – this book reminded me a lot of Shannon Hale’s Books of Bayern, and this is not praise I give lightly. There’s the same sense of betrayal and urgency as with Isi’s story in The Goose Girl, the same awesome, uncontrollable scope of magic of Enna and Rin with Enna Burning and Forest Born. Everything about Mistwood makes it a memorable, captivating debut. The only thing I was disappointed with was the romance aspect of the novel – which felt rushed, out of the blue, and forced in my opinion (I’m not a fan of romance being thrown into a novel for the sake of having a romance – and, unfortunately, that’s how the ultimate pairing felt for me). That small niggle aside, Leah Cypess’s Mistwood is a world that I loved, and cannot wait to return to one day soon. Notable Quotes/Parts: Thanks to Harper Collins’ Browse Inside feature, you can read the first 60 pages of Mistwood online HERE. Verdict: An exquisitely told fantasy, Mistwood is a poignant novel of self-discovery and the gift of choice. Absolutely recommended to readers of all ages. I can only hope that Ms. Cypess returns to Isabel’s mistwood, and soon. This book is like Goose Girl?! I’m so on board! I can’t wait to get this one from the library! I’m so happy you loved it, Thea. I love your review. From the reasoning behind Isabel’s derivation to the gray characterization. Spot on. I’m very much looking forward to the companion novel. I love the book…..but….WHY THE HELL SHOULD VEN AND KAER DIE????? ?WHY OF ALL PEOPLE!!!!!!WAHHHHHH!!! !After I read the book i have been palying gloomy songs for a week!! !First..I began to like Ven…but he died and then Kaer’s appeared..BUT THEN HE DIES!!! !And where did Albin go?OH please!! !I hope the author makes a three where kaer and ven live or brought back from the dead…I hope clarisse will never be included…OH PLEASE!!!!!PLEASE!!!! (Im begging here!) Oh leah…If only you can hear my pleas!!!!Please! !